I usually go solo at The Hope Institute’s graduation ceremony, but I decided to change it up this 5th and final time around. So I invited my singalong bandmates to join me for a more upbeat song that I knew my students and coworkers would love. And boy, was I right. The packed room was jamming right along with us to Katy Perry’s hit song “Firework” — singing, clapping, and even dancing. I wish this video showed the audience, because watching them was the best part. The vocals sound a little drowned out from where the video was taken, but I wanted to share it with you anyway. It was such a fun afternoon…the absolute perfect ending to my last full week at Hope, and a great start to Memorial Day weekend. I hope you’re enjoying the weekend, too! Never in my professional life have I felt more loved and appreciated than this week. I knew going into my last week of music therapy sessions with my students (most of whom I’ve had for the past 4 years) that it would be tough, but they’ve made it even tougher by showering me with well wishes and beautiful going-away gifts. Yesterday at our spring singalong, students presented me with flowers, cards, and a beautiful picture made by our art specialist at The Hope Institute. It is now hanging in my new studio waiting room, and will serve as a reminder of my time at Hope every single day. This morning, I was feeling pretty proud of myself for getting through the last music therapy session with one of my favorite classes (though of course I love them all) without crying, and then gave me the wind chime they made for me, pictured above. It says “Jeni’s Class, May 2011” and “Hope” at the bottom. And how coincidental is this? Right near where I’ve hung my new picture in my waiting room, there is a hook in the ceiling left by the previous owner. I was planning to hang a plant there, but now I have a beautiful wind chime instead — which color coordinates perfectly with the picture! This afternoon is graduation, which is pretty fitting for my last day of classes considering singing at the 2007 graduation ceremony was the first thing I ever did at Hope. I’m looking forward to doing so one last time…hopefully without tears (but I make no promises). This morning, one of my co-workers asked me if I was ready for my “final hurrah” at The Hope Institute, and I thought that made a great title for this post. Four years ago, I started a new tradition at Hope: an all-school spring singalong. I rounded up some of my musician co-workers and started a band, complete with drums, bass, rhythm guitar, and vocals. Every year since, I’ve looked forward to this event all spring long. Today is that day. The picture above is from last year’s singalong, and I realized that I’m wearing those same shoes again this year :) I’ve chosen a dozen of my students’ favorites tunes, made up packets of lyrics for everyone, and set up the instruments and sound equipment. Now all that’s left is to rock out! 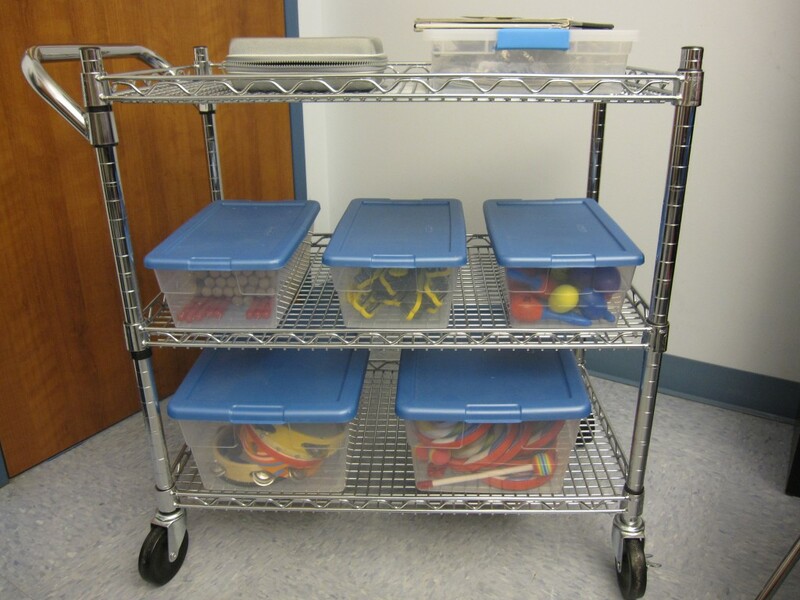 I have to admit: pulling a cart from classroom to classroom took some getting used to at first. Four years later, though, my trusty cart is like an extension of myself. That and my guitar, of course. I know very well that I’m not the first music therapist or teacher to travel with a cart. The speech therapists and art specialist at my school do the same, and it works extremely well for our students. They get to stay in their classroom or activity room, where they feel the most comfortable, and we take only the materials we’ll need on that particular day. That being said, I wish I had a third eye to keep on my cart during particular music therapy sessions. It can be a little too tempting for several of my students at times, especially when there are favorite instruments or equipment on it. Some teachers keep a sheet over their carts while working with students, which is not a bad idea at all. So what do I put on my cart? Well, the instruments change from week to week, as do any visual aides or props that accompany my activities and interventions. Every so often, I’ll bring along my iPod and speaker, which I use as positive reinforcement for a few classes. My visual schedule and guitar stand are cart staples, since I use them every day in every classroom. Pretty soon, I’ll be passing my cart down to my intern, who will be taking my place when she graduates and I go full-time with my private practice. It has served me well over the years, though I’m not sure how much I’ll miss the fun of squeezing it in and out of my office several times a day! Do you travel by cart, too? 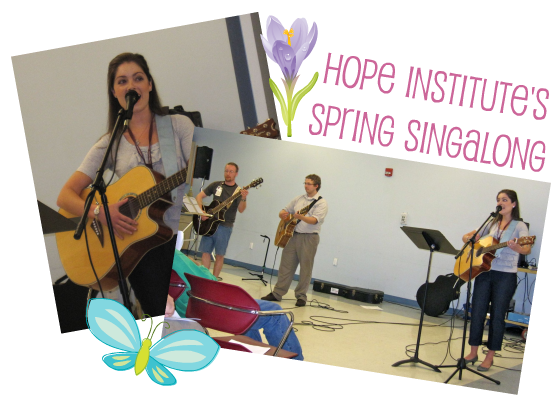 A little over four years ago, I began my professional career as a music therapist at The Hope Institute in Springfield, Illinois. Although many of my new coworkers at Hope, a residential school for children with multiple disabilities, were unfamiliar with music therapy, they were amazingly supportive of me as I started developing the program. At the same time, I was slowly growing a private practice. After an 8-hour day at Hope, I hit the road as a traveling music therapist and voice/piano/guitar teacher, working with my students in their homes. I did this 5 afternoons a week, for two years, until my husband and I moved into our new home and I opened a home studio. Ten private students increased to 20, which eventually increased to 30. I loved the work that I was doing at Hope, and I loved the work I was doing in my private practice. Life was good. But life was also exhausting. When I added my church music job, elected IAMT officer position, and Listen & Learn to the mix, I sometimes marveled at the fact that I actually found time to sleep. Oh yea…and then there was my husband and dog, with whom I was spending less and less time. 12-hour workdays were doable, at least for the time being. But what would happen when Zach and I started a family? And was it really good for my health to be this busy and stressed all the time? I found myself asking these questions on a daily basis. So what did I do? I took on new students. Over 20 of them, actually, totaling to 52 private students for the upcoming summer and fall sessions. And then I made the scariest and most exciting decision of my entire life thus far: I gave notice of my resignation at The Hope Institute. This moment, which I had been dreading, turned out to be like something out of a fairy tale. My principal told me that I would be greatly missed, but that he completely understood my decision and supported it wholeheartedly. And then upon my recommendation, Hope hired Karen, my wonderful intern who has been such a blessing to the music therapy program this year. I am infinitely grateful to my colleagues and students for providing me with such an amazing, challenging, rewarding, overwhelming, fun, and educational experience these past four years. My work at Hope not only gave me credibility in my community, but it also connected me with so many people who enriched my life and opened the door to countless opportunities. I’m going to miss this place. But as sad as I am to be leaving, I’m equally excited about this new chapter in my life. Going full-time with my private practice will be a challenge, to be sure, but it will also allow me the flexibility and free time I’ve not had thus far in my career. June 2 is my last official day at Hope. I’m going to enjoy this final month to the fullest, and then prepare for what promises to be quite an exciting adventure. I hope you’ll come along with me.